TP Freight Lines is a multi-functional carrier specializing in less-than-truckload freight to be delivered anywhere in Western Oregon and Southwest Washington. Our normal delivery time is next working day to all major points in our service area. We work with most national and regional LTL carriers to expand and complement their service. Overnight connections to/from most of Washington, Oregon and Idaho is available. Two-day service to all California points south of Sacramento is available as well. The company began as a general freight carrier operating between Tillamook and Portland, Ore., in 1922. Some commodities carried in the early days were bread, cheese and motor fuels. In the 1980s, TP Freight Lines expanded to cover all the Northern part of the Oregon Coast and the Peninsula area of Southwest Washington. A sister company, L.C. Hall Truck Lines, was purchased in the early 1990s. 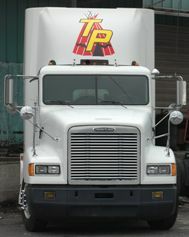 TP Freight Lines expanded along the entire Oregon Coast in the mid-1990s and moved into Medford and Eugene in 2002-2003. Both TP Freight Lines and L.C. Hall’s Truck Lines work closely with major corporations such as Nike, Georgia Pacific, Northwest Natural, Columbia Sportswear, Owens and Minor, HD Supply, Dometic, Excel Garden, American Warehouse, Spicers Paper and West Coast Paper. L.C. Hall’s Truck Lines operates from St. Helens, Ore. and serves northwest Oregon and Southwest Washington from the Portland area along both sides of the Columbia River to Wauna, Ore.
L.C. Hall’s provides less-than-truckload (LTL) service to many customers in the area, including Boise Paper Products and Georgia Pacific’s Wauna paper mill. The company also operates a full-truckload service that covers all points in Oregon and Washington.